There’ll be not one, but two quartets on stage when the show “In My Life — A Musical Theatre Tribute to the Beatles” returns to the Admiral Theatre at 7 p.m. Oct. 13. First, there’s the Beatles tribute band Abbey Road play the parts of John, Paul George and Ringo in the show. They’ll be accompanied on five songs by a local foursome, the Olympic High School String Quartet. “Eleano r Rigby,” “Yesterday,” “A Day in the Life,” “Hello Goodbye” and “Hey Jude,” according to information provided by the show’s producers. 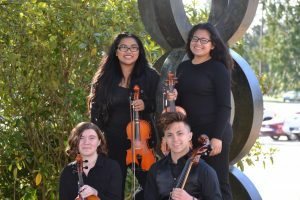 This is the second time a OHS quartet has been brought on for “In My Life,” students also performing in 2014 after the show’s producers contacted OHS instrumental music director Paul Williams looking for a referral. This actually is the show’s third time in Bremerton after making its Admiral debut in 2013. “When we find a strong program like the Olympic High School orchestra, we seek them out year after year,” said producer Andy Nagle. Macazo is the only senior with the quartet this year; Alvarado, Gardner and David all are juniors.